It’s time for you to send an email to your list — but you’re scared silly. Now that you’ve grown your mailing list beyond just your closest friends and family, sending emails to your subscribers has turned into a nail-biting experience. When you’re sending an email, there are a lot of little details to remember — and those details can make or break the success of your email campaign. Email mistakes are difficult to correct and can be costly or damaging to your reputation. That’s why we’ve created a step-by-step checklist that contains the elements you need to think about before you send an email to your list. Think of it as a quality-assurance check for your marketing emails. Let’s start at the top (and don’t forget to scroll to the bottom of the article to get your free email checklist PDF). When your recipient checks her email, she looks at the “from” field to see who sent the email. The information in this field helps her decide whether to open your email or click “delete” and move on. If possible, you should put an individual’s name in this field. It’s fine if you want to include your business name also, but it should say “Your Name from Company Name” or “Your Name, Company Name” to give the recipient as much information about you as possible. Make sure your “reply to” email address is valid and checked on a regular basis. Thirty-five percent of email recipients decide whether to open an email message based solely on the subject line — so you must thoughtfully craft the subject of every message you send. It’s critical that subject lines convey a specific benefit to pique your reader’s attention. Your subject line is like the headline of a blog post — you get one chance to convince your recipient to keep reading. You can also customize your subject line with your recipient’s name by inserting dynamic tags. Most email service providers make it fairly straightforward to do this — but you must carefully maintain your list data. You never want a recipient to see, “Sign up today, [NAME ERROR]” in a subject line in his inbox, so list accuracy is key. Contain 40 characters or fewer. Create a sense of urgency, if possible. Why should your reader open this email now? Never deceive or mislead. Don’t misrepresent the content of your email — it will annoy the recipient and increase your unsubscribe rate. You can include an opening greeting in your email, although it’s not always necessary. “Greetings,” or something similar, could work for you, or you can launch directly into the main body of your message. This is another place where you can insert dynamic tags to customize your email, but again, make sure you perform careful list maintenance on a regular basis if you do. Keep the body text of your email concise; every line of your copy should be meaningful and interesting for your reader. Make the content visually appealing and easily scannable by using short paragraphs, subheadings, and bullet points. Use a clean and minimal email template with lots of white space. If you’re using graphics in your email, make sure each image is relevant and correctly sized. Your images should complement — not detract from — the content of your email. Always check the ALT text for each image, too. An image’s ALT text will be visible if it doesn’t load in a particular email client, so don’t accidentally include embarrassing or inappropriate file names in the ALT text for your images. After reading your message, your recipients should know exactly what to do next. That means you need to include a strong and clear call to action in every email. Whether you want your reader to call you for a consultation, click on a link to read your latest piece of content, or reserve a seat in your upcoming online class, it’s your job to communicate that next step in a way that is impossible to miss. Consider creating a button you can use for your call to action instead of a plain text link. This will make it easier to click on mobile devices. Buttons should be at least 44 by 44 pixels. Make it easy for your readers to share your email content by including social sharing icons and a “Forward to a Friend” button. The CAN-SPAM Act of 2003 mandates that you include certain information in the footer of every email you send. You must include your address in your footer. This could be your current physical address, a post office box, or a private mailbox you’ve registered with a commercial mail agency. Your email service provider will automatically add this information in the footer of every message, but it’s up to you to make sure your address is up to date. Every email must include clear instructions for unsubscribing from your list. Your email service provider will also automatically add this link, but you need to make sure it’s clearly visible and functioning correctly. Not having an “unsubscribe” link in your emails is a big taboo with CAN-SPAM, and it can cost you a fortune if you mess this up, so be safe and check your unsubscribe links on a regular basis. It’s a good idea to include a plain text version of your email if you’re using an HTML email template. Some of your recipients may prefer or require a plain text message. Your plain text email cannot include any hyperlinked text or special formatting, and you should limit the body of the text to 75-characters wide or fewer. Most email service providers either generate the plain text version of your message automatically or give you the option to create a plain text version of your message in your email editor. Your readers need to be able to read and act on your email from their phones and tablets. Keep your design to a single-column format, between 320 and 550 pixels wide. Make sure images are sized correctly and rendering accurately. Make all links (and particularly your most important call-to-action link) large and easily tappable. Spread out links to make each individual one easy for readers to tap. Set the body text of your email to at least 14-point font. Many email service providers include a spam checker within their editors. After creating your email, run it through the spam checker to make sure you haven’t included too many spammy-sounding words or phrases that will get your email flagged as spam. If your email service provider doesn’t have a spam checker, you can use this one. Almost all email service providers offer a simple way to send a test version of your email message to yourself. Proofread every line, from the subject to the sign-off, to catch any little mistakes. Review the “from” field and “reply to” address. Examine the subject line of the email — your recipient should be able to read the full subject line in his email client. Confirm that all images complement your text and are rendering correctly. Verify that all links work correctly and lead to the right sites. Double-check that the email design looks good on desktops, laptops, and mobile devices. Ensure that any preview text that may appear in an email client or mobile app (usually the first 100 characters) is compelling and will make your readers want to open your message. You can download our editable PDF of this checklist (45 KB) and reference it whenever you send an email. Use this checklist as a starting point, and customize it to fit your messages. 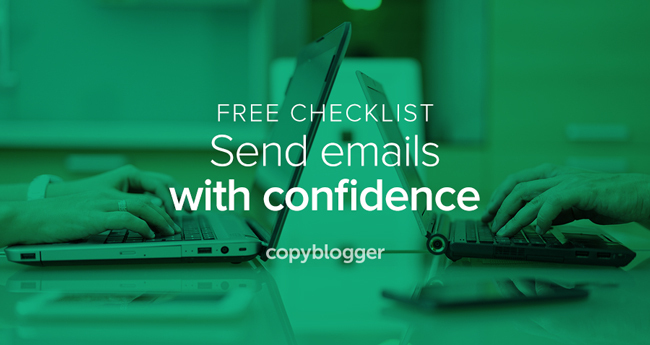 The more you send emails to your list, the easier it will get. Soon, you’ll feel considerably more confident when sending email campaigns. Your subscribers (and your bottom line) will thank you for it. Are there other items you’ll include in your own “Before You Send” checklist?